Director: Fred Zinnemann. Cast: Ivan Jandl, Montgomery Clift, Aline MacMahon, Jarmila Novotna, Wendell Corey, Mary Patton, William Rogers, Leopold Borkowski. Screenplay: Richard Schweizer (based on a screen story by Richard Schweizer and David Wechsler). 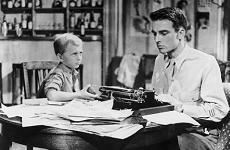 This review joins several other articles, essays, and creative exercises within the Montgomery Clift Blog-a-Thon hosted by my friend Nathaniel, in honor of what would have been Monty's 87th birthday on October 17, 2007. Because The Search is primarily famous these days as Montgomery Clift's first released moviethough he actually filmed it after completing Howard Hawks' Red River, which opened later the same yearFred Zinnemann's poignant drama about orphans in postwar Germany holds two pleasant surprises for contemporary viewers. One of these is that Clift does not appear until a third of the way into The Search, and in fact the most familiar, almost platonic notion of "Montgomery Clift" never appears at all. We first glimpse him lounging in his jeep and enjoying a sandwich as he spies a terrified, twelve-year-old ragamuffin pausing in a huge pile of rubble to the side of the road. From the moment he offers the boy his lunch, you can guess pretty much how their relationship will proceed, especially since we know that, in a parallel plot, the boy's opera-singing mother is still alive and determined to find him, or at least to certify his fate. Refreshingly, however, Clift's character, "Steve" Stevenson, is not a dour or battle-hardened veteran before the heartwarming experience of meeting the boy, nor is he a young castabout for whom the boy's fortuitous arrival in his life furnishes a fast track into maturity and generosity. Steve already registers his emotional depth and perceptive compassion when he meets young Karel (Ivan Jandl), whom he renames "Jim." His best buddy in the unit, nicely sketched by Wendell Corey, refuses to serve as an arbitrary foil and stands fully beside Steve's goals of tracing Karel's relatives and, when that project fails, of planning to restore the boy to UNRRA protection until he can arrange to adopt "Jim" officially and bring him over to the United States. Young men, especially at the movies, are much rarer finds in this generic position of orphan-protector and aspiring caretaker than old codgers or childless women or preternaturally wise teenagers, and yet the script by Richard Schweizer, based on an Oscar-winning story he wrote with David Wechsler, admirably refuses to provide Steve some wrinkle in his backstory or some wound in his intimate life or some deficit in his character that badly needs redressing in order to "explain" his extensions of kindness and care to Karel. This purity of intent and casual decency of demeanor, even when this young bachelor barely knows what to do with a shell-shocked orphan who speaks no Englishand whose tattooed arm instantly explains his fear of fences, uniforms, gates, and locked doorsis gracefully highlighted by Montgomery Clift. I am tempted to say that the actor, who challenged our precepts of masculine psychology and capacities of feeling throughout his brilliant but truncated career, never again won the chance to work his subtle, thoughtful magic in so unneurotic a context. Steve differs from the Clift "type" as much as he does from typical mentor-protectors that we tend to meet in movies about orphans, both American and otherwise. He is loose in movement and persuasively natural in expression, frustrated and saddened by Karel's plight but not, as per usual, by any existential despair or ostracisms from macho bonhomie or cobwebby sexual repressions. He is careful not to sanctify the character, and beyond the occasional outburst of impatience with Karel, his refusal of even physical gravitas keeps the character refreshingly life-sized: he ambles around his apartment like an ordinary fellow, not a soldier or, worse, a symbol, and he rides around in his jeep like it's a car he's had forever, not a revered emblem of martial office. Steve may not have the depth of Clift's later and more famous characterizations, just as Clift himself has an adolescent gangliness and a hollowness of cheek throughout The Search that restrain him a bit from that full bloom of charismatic handsomeness that gave him such magnetism in A Place in the Sun and From Here to Eternity. Still, he serves the character and the movie wonderfully, and while I'm always inclined to rank Clift a little ahead of peers like James Dean and the young Paul Newman, especially for fineness of insight and facility with nuance, his lightness of touch and his avoidance of deep characterization here make him a lovely partner to Ivan Jandl, who is so stirring and plaintive and powerfully sad as young Karel. So many of Clift's characters have a hell of a time relating comfortably to anyone on screen that to see him so at ease with a child, of all people, solacing the kid's despair instead of mirroring it with any of his own, is a real revelation. The other welcome surprise about The Search, as distinct from the movie that modern renters might expect, is how deftly realized and fully engaging the film already is before Clift's arrival, and how little predicated the film's success is on his presence or his performance, strong though they are. Throughout the first half-hour, Zinnemann builds solid foundations for The Search as both a well-modulated immersion in the experience of stunned and stranded children and a time-capsule of the scarred land and crumbled cityscapes of Germany after the war. (The Search was the first movie licensed for shooting in the U.S.-administered zones of Germany.) Zinnemann, an able storyteller and adequate shepherd of his actors, does not always inspire consummate admiration from the standpoint of style or form, and so watching him manage the balance between the tactful, image-driven, and non-intrusive realism of the exterior sequences and the more intimate and story-driven narrative scenes is a pleasure in itself. The Search may not be Bicycle Thieves, and its orientation is certainly that of an after-the-fact witness rather than that of a fully implicated citizen-observer, but in economy and unforced eloquence, The Search easily bests Zinnemann's ostentatiously compressed and overly literal High Noon or his sentimentalization of history in From Here to Eternity (where I think that approach still pays its own rewards) or in Julia (where I'm sure it doesn't). Wisely, The Search doesn't restrict itself to cutting back and forth between its two stylistic registers. The best sequences marry these registers together through smart choices of editing and camera placement. For instance, Zinnemann mounts an exciting narrative sequence where Karel and another young orphan flee out the back of a U.N. truck, believing themselves to be heading for another concentration camp. The credible and understandable terror of all the children in that truck registers so strongly that you wonder how Zinnemann engendered such panic in such young and clearly European "actors," and whether his strategies could possibly have been above-board. Nevertheless, the marvel of the sequence involves Karel and his friend's running away from two pursuing aid workers, which emphasizes the boys' speed and anxiety while also evoking the physical environment and tonal atmosphere of the larger region, and also the cosmic injustice that ends with one boy's drowning and the other's survival, not despite but because of the fact that he was an uncertain swimmer and a bit of a laggard.